(Nanowerk News) When grabbing a snack from a food truck, you're likely to find delicious fillings wrapped in a tidy packet of dough. It's easy to visualize the way handheld foods, like empanadas or dumplings, form a half-moon shape. But, until recently, researchers have known far less about how wrapped objects behave at a microscopic scale. Enter Joseph Paulsen, assistant professor of physics in Syracuse University's College of Arts and Sciences, who is the co-author of a new report in Nature Materials ("Optimal wrapping of liquid droplets with ultrathin sheets"). He says the mechanics are remarkably similar. A liquid droplet wrapped in an ultrathin elastic sheet resembles a 3 millimeter-long empanada. Paulsen researches soft condensed matter physics or, "the study of things that are squishy," he explains. This area of research focuses on substances that can be easily bent or deformed, such as liquids, foams, and gels. In this case, Paulsen and colleagues investigated the way very thin elastic sheets wrap droplets of water. Wrapping droplets may come in handy when dealing with dangerous or delicate liquids. Using thin sheets to cover droplets, instead of conventional substances like the surfactant molecules in soap, provides unique advantages, including creating a stronger barrier. Paulsen wrapped drops of water with elastic sheets 1,000 times thinner than a human hair to understand the mechanisms of containment when a wrapper offers almost no resistance to bending. The team expected to find the sheets wrapping drops in a spherical shape, like a tiny drop of dew. "What was surprising is that the wrapped droplets look like street foods -- like a calzone or an empanada", Paulsen says. Watch a drop being wrapped. In order to figure out why wrapped droplets aren't spherical, Paulsen teamed up with Vincent Démery, a theoretical physicist, while they were both postdoctoral researchers at the University of Massachusetts, Amherst, working with experimental physicist Narayanan Menon, theoretical physicists Benjamin Davidovitch and Christian Santangelo, and polymer scientist Thomas Russell. By mathematically modeling wrapped droplet shapes, the researchers discovered that the characteristic half-moon shape arose from a fairly simple principle. "The polygonal shapes are more efficient at covering the drop, meaning that less area of the drop remains exposed to the outer liquid," Démery explained. The team also discovered that sometimes the simplest answer is the most informative- at least when it comes to predicting wrapped shapes. The wrapping of each droplet creates its own pattern of folds, crumples, and wrinkles as the sheet collapses around the liquid. The researchers found that these intricacies could be ignored when predicting the final conformation. All that mattered was identifying the most efficient three-dimensional shape. 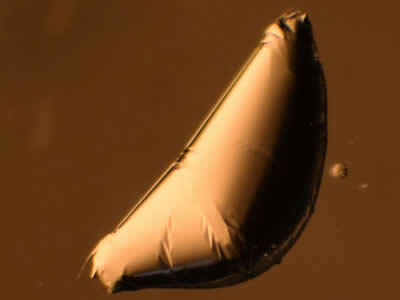 Paulsen experimentally investigated wrapping by devising clever methodologies to place a delicate elastic sheet on a water droplet immersed in oil, "sort of like a polar cap" Paulsen says. As liquid from the droplet was slowly sucked out through a small straw, the thin sheet collapsed around the droplet. Publishing in Nature Materials is a thrilling reward for the team's hard work Paulsen says. "It's a journal that has high visibility and will let a lot of people see this work and develop this type of research further."